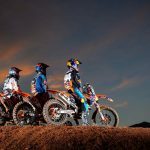 Press Release: Red Bull KTM Factory Racing’s Ryan Dungey emerged victorious despite challenging track conditions at the 17th and final round of the 450SX Championship in Las Vegas, Nevada. 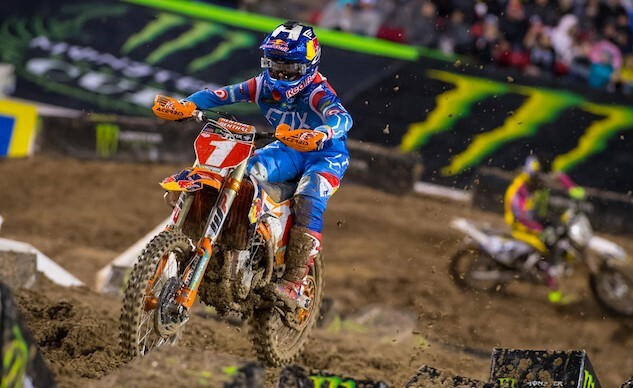 After clinching the 2016 450SX Championship at the penultimate round last week, Dungey rounded out the season in a big way with his 31st career victory. 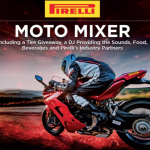 Inclement weather cancelled the morning’s qualifying sessions as a major downpour occurred just after the first practice. As a result, the evening’s qualifying positions were pulled from the free practice, where Dungey put his KTM 450 SX-F Factory Edition atop the field, with Musquin in the 7th place position.Both riders were seeded into 450SX Heat 2, where unfavorable track conditions awaited following hours of heavy rain. Despite the muddy obstacles, Dungey captured the holeshot and led all five laps of the heat race. 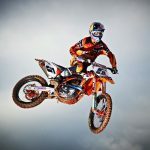 Musquin began the race in the 5th place position where he was unable to make an advance into a transfer spot. Musquin lined up in 450SX Semi 2, where he was able to secure a transfer position into the Main Event with a 3rd place finish. In the 450SX Main Event, Dungey shot off the line to capture the holeshot and the early lead in the race, while Musquin followed close behind in 4th. Dungey led the first six laps of the Main Event before Ken Roczen made a pass to take over the lead. However, Roczen lost control and crashed through a rhythm section soon after, and Dungey, with nowhere to go, ran into him and crashed as well. Dungey quickly remounted and reclaimed the lead, while Roczen eventually pulled off. Meanwhile, Musquin was riding a solid pace inside the top five when he landed off a double and collided with another rider, causing him to crash hard. As a result, Musquin was forced to pull into the mechanic’s area to make adjustments to the bike. 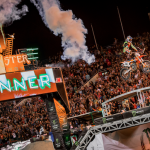 Dungey held strong amidst a chaotic Main Event to capture his 9th victory of the season in Las Vegas.